SwiftCash is an open-source, self-funded system of decentralized governance and economy born out of a desire to create a digital store of value with a consistent and stable growth model, as well as a peer-to-peer cryptocurrency for daily transactional use. SwiftCash uses the revolutionary Proof-of-Stake algorithm to reach consensus and allows up to 70% of future block rewards to be spent on proposals that are embraced by the community — stakeholders. Therefore, 30% of maximum monthly inflation goes directly to stakeholders who help secure the network, and whether the rest is mined or how it’s spent will also be decided by the stakeholders. The revolutionary Proof-of-Stake algorithm offers a solution to the problem posed by the exponential increase in energy consumed by Bitcoin, and other Proof-of-Work cryptocurrencies. Proof-of-Work mining is environmentally unsustainable due to the electricity used by high-powered mining hardware and anyone with 51% hash power can double spend. SwiftCash utilizes the green protocol, an energy-efficient Proof-of-Stake algorithm, inspired by Bitcoin Green, and originally developed by Peercoin developers, can be mined on any computer, and will never require specialized mining equipment. The green protocol offers a simple solution to sustainability issues posed by Bitcoin and other Proof-of-Work cryptocurrencies, and provides a faster, more scalable blockchain that is better suited for daily transactional use. A lot of Proof-of-Work cryptocurrencies have come under what is known as 51% attacks, since their invention. These attacks are possible only when the exploiter can acquire more than half of the network’s hash power, often by renting this power from online businesses such as nicehash. One common solution to these attacks on Proof-of-Work networks is to centralize the mining of blocks. In this method, miners are required to sign each block with a private key that is issued by central authorities, such as the developers. Proof-of-Stake mining on the other hand, which is also known as staking, is fully decentralized. Anyone with a stake in the blockchain can try to find and register new blocks, and a 51% attack is going to require the attacker to acquire 51% of the active stake that is online and is trying to find new blocks. Therefore, the more stakeholders participate in mining/staking, the more secure the network becomes, as the cost of an attack increases. This is reflected in what is known as the difficulty. With Proof-of-Work mining, the attackers can invest in a strong mining infrastructure once, and use it to attack as many Proof-of-Work blockchains as they want, whereas with Proof-of-Stake mining, also known as staking or minting, the attackers will have to invest in each blockchain individually, and each time they attack a blockchain, they also attack their own investment! Another thing that makes Proof-of-Stake mining a better solution, is saving money on energy costs and being friendly to the environment. To give an example of how extraordinary the difference is, it might be noteworthy to point out that Bitcoin mining for example, at the time of writing this, consumes more electricity a year than the whole country of Ireland! And last but not least, the revolutionary Proof-of-Stake algorithm gives the inflation to stakeholders rather than third-party miners, who may or may not be invested in the blockchain. SwiftCash has a unique initial distribution which was originally forkdrops on most SmartCash addresses, with filters targeting problematic ones such as huge amounts of centralized budgets controlled by the hives or core teams, and their direct down streams, as well as known exchanges, hackers and exploiters. This let us start with appx. 300 million coins out of which only 1 million was set aside for funding the initial development. For more information about the filtering criterias used, please refer to the first edition of the whitepaper. Almost 14 days after launch, we realized a known SmartCash exploiter had more than 1000 addresses with over 16 million coins in forkdrops. The community acted quickly and through a fork/reset, we managed to remove these coins from circulation. Appx. 3 months after this fork/reset, we noticed that more than 75% of the forkdrops had not yet been touched. This was having a tremendous effect on the inflation of claimed forkdrops, which were far more than what we had originally anticipated, due to more than 75% of the supply not participating. A proposal was introduced, and active stakeholders voted to put a deadline for forkdrops to be claimed and to reset the chain at the end of the deadline, and to remove unclaimed forkdrops, and to also slash the inflation by 60%. The final fork/reset caused us to start with appx. 78 million coins, which was less than 2% of the maximum supply. SwiftCash uses a decentralized system of governance to reach consensus about the direction and scope of development, support and outreach activities. Higher stake will have higher voting power and so this way, all key decisions will ultimately be made by active stakeholders. In order to be able to vote, stakeholders need to setup and maintain a SwiftNode, also known as a Masternode. SwiftNodes require 50K SWIFT, plus a VPS, as well as a unique IPv4 address. Our vision of governance is that proposals can even be submitted to hard fork the main chain, and if enough stakeholders vote yes, who should stand in their way? After all, the blockchain belongs to stakeholders and therefore, it is crucial for stakeholders to continue to be actively involved in key decisions by voting yes, no or abstain to proposals. Unlike some projects, we do not have any hard-coded address that is going to continually get paid, no matter what. Each payment from the community treasuries needs approval from stakeholders through proposals and onchain voting. That includes the developers, admins and anyone else involved in the community. Everyone has to go through the same process to get paid anything from the treasuries. Stakeholders will have the final say at the end of the day, and will hire and fire contractors as pleased. A maximum of 70% of our theoretical block rewards are set aside for budgeting, out of which 10% are set aside for SwiftRewards. If the total budget is used every month, maximum supply of 5 billion coins will reach in about 185 years. However, we think this is an extremely unlikely scenario. The more likely scenario will be that at least about 30-40% of the theoretical block rewards will turn into future reserves, which means that it will take us more than 500 years to run out of block rewards, and rely on fees and donations only. The cost for submitting a proposal is 100 SWIFT and once a proposal passes, 10 SWIFT will be required to finalize the budget in the blockchain, so that passed proposals can get paid in the next superblock. Superblocks are a few blocks, in which proposals that have passed get paid, and this happens every 43,200 block or appx. every month. Proposals need to be on chain for at least 10 days before they can be finalized and get paid. Finalization happens 2 days before each superblock; so deadline for submission of any proposal to get paid from a particular superblock is 17,280 blocks or appx. 12 days before each superblock. Each proposal can only ask for a maximum of 20% of the maximum monthly budget. In case there are more winning proposals than the maximum available budget, proposals with more votes will be finalized and get paid. Each proposal will need a minimum of 10% of the network in yes votes(Yeas), minus no votes(Nays), in order to pass. That means if there are 1,000 SwiftNodes, a proposal will need at least 100 Yeas vs. 0 Nays, or 150 Yeas vs. 50 Nays in case of a 20% participation rate. Therefore, the lower the participation rate, the more the required passing point. This means that in case of 100% participation, required passing point will be 55%, whereas in case of 10% participation, which is the minimum participation rate required for any proposal to pass, required passing point will be 100%. That is to say if only 10% participate, everyone who participates must vote yes for the proposal to pass. Due to the nature of continuously diminishing block rewards and its effect on the markets, only a maximum of 3 payments per proposal can be asked for. Longer-term proposals will need to be re-submitted every 3 months; votes can be updated one hour after each submission, and that includes votes on proposals that have already passed and got paid once or more. Furthermore, a URL must be attached while submitting a proposal, which should include the details of the proposal. The recommended platform for the details of proposals and also any pre-proposal is the STEEM blockchain which is not only independent from SwiftCash, but also decentralized and resistant towards censorship. Recommended hashtags for SwiftCash proposals and pre-proposals are #swiftproposal and #swiftpreproposal respectively. As a result, there would be one possible airdrop each month, two possible airdrops every three months, three possible airdrops every six months and four possible airdrops every twelve months. As mentioned above, those who hold longer, would be rewarded more, if price depreciates; and the more price depreciates, the more rewards will be dropped on holders! These airdrops will be done by community ambassadors via a multisig address and the required funds and elected ambassadors will need to gain approval from stakeholders via a proposal. SwiftRewards will be a maximum of 4%, 3%, 2% and 1% of block rewards for tier 1, 2, 3 and 4 respectively - i.e. a maximum total of 10% of future block rewards. For tier 1, each 1% drop in the average price from the start of the snapshot to the end, results in 0.08% of future block rewards being dropped on holders. First snapshot for each tier begins one snapshot late to make things fair to the future adopters. That means, first snapshot for tier 1 will start at block 43,800 while the first snapshot for tier 4 will start at block 525,600. To give an example, if the average price is recorded as 0.10 USD at block 43,800 and then becomes 0.075 USD by block 87,600, holders will receive 2% of the block rewards during that period. That is 25 times 0.08% due to 25% drop in the average price. Price drops of more than 50% will not affect the amount of airdrop, since maximum amount of available coins to airdrop will be reached. Block rewards are set to be only 15 SWIFT per block up to block 10,000. This is to make the launch fair and give the community about one week to set up their wallets for staking and/or servers for SwiftNodes. From block 10,000 rewards will start with 200 SWIFT per block theoretically, but only 30% of this amount will be mined every block, which will be split between SwiftNodoes and PoS miners, with a ratio of 2 to 1. The rest of the theoretical block rewards are set aside for budgeting, and will only be mined on demand via proposals, should enough stakeholders or SwiftNode owners to be specific, vote yes. Block rewards are set to fall gradually to zero and the gradual curve is very slow and becomes even slower as time goes by. 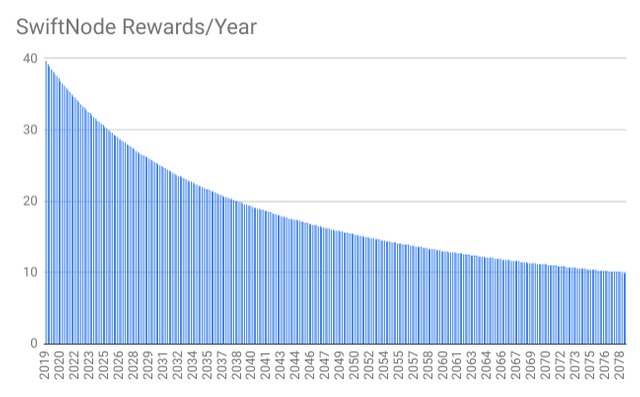 It will take 20 years for block rewards to halve for the first time; second halving will take an additional 40 years, third halving will take an additional 80 years, and so on and on. This gives us a maximum inflation of appx. 120% in the first year, 54% in the second year, and so forth. Maximum inflation however is most likely not going to occur due to unused treasuries which turn into future reserves. Furthermore, as an example, Bitcoin has mined over 80% of its maximum supply in less than 12 years, and SmartCash has mined about 40% of its maximum supply within 18 months, while if we consistently use the whole budget, which is very unlikely as explained above, it is going to take us 30 years to reach 40% of our maximum supply! That is great news for future adopters and we do this because we have a long-term goal; what we want is a decentralized cryptocurrency and economy to benefit everyone in the world in decades to come, not a pump and dump ponzi scheme. 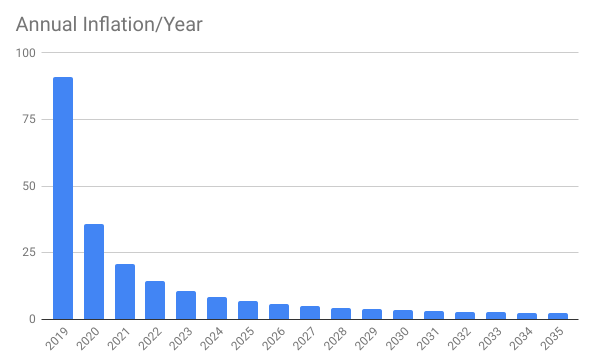 Having said that, the following chart depicts the annual inflation of SwiftCash within the first 17 years, with the assumption that 30% of the theoretical block rewards will turn into future reserves due to unused treasuries. As depicted below, annual inflation in the first year would be about 90%, and would then reach about 2% in the 17th year. 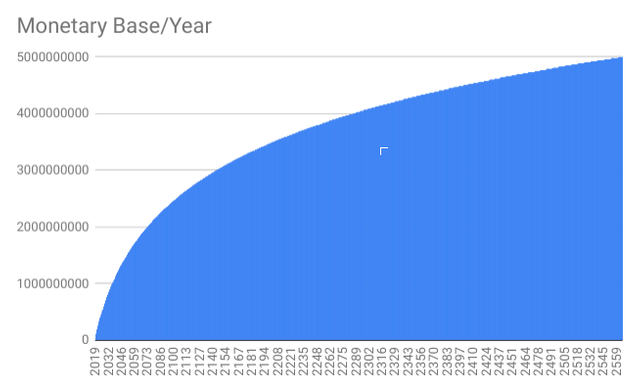 SwiftCash monetary base with the same assumption that 30% of the theoretical block rewards should turn into future reserves, will look like below. As it can be seen, it will take us more than 500 years to reach the maximum supply of 5 billion coins. In order to get an insight into how slow our block rewards are going to decrease, we can have a look at the following chart which depicts the SwiftNode rewards in the first 60 years. As it can be seen, SwiftNodes will initially get about 40 SWIFT per block, and by the end of the 60th year, they will be getting about 10 SWIFT per block. The extremely slow curve is designed by intention to not only stabilize the price as we grow, but to also decentralize the distribution of block rewards by making inflation fairer to future adopters, compared to most, if not all cryptocurrencies out there. Our Twitter accounts are @swiftcashcc and @swiftcashorg. I handle @swiftcashcc and someone else is in charge of @swiftcashorg on Twitter and that one is meant to be for the spanish community and the person is also in charge @swiftcashespanol on steemit. I told him to get back to your tweet. If you look at our website swiftcash.cc, you will see that this steem account is on the website too. Seems like a step backward to me. Why 1-minute block times when other existing PoS chains already have 3-second or less block times? What’s the point of making things 20x slower (or more) than your competitors? That’s a small swing and a huge miss in my book. If by other PoS chains you mean chains like STEEM, it's a different game imo. You have known 20 witnesses with STEEM who produce the majority of the blocks, and so it's not as decentralized as the POS here which was originally designed by Peercoin. I believe blockchains like STEEM are known as DPOS or delegated proof of stake as opposed to POS or proof of stake since witnesses are picked by votes. Not saying it's a bad thing. Each can have their own pros and cons. And it's simply not advisable to do lesser block times with POS due to how you can get orphan blocks unless you're DPOS like STEEM. Having said that, that's why Masternodes exist. Masternodes give six instant confirmations to transactions that are sent via SwiftTX. They basically lock the transaction in memory instantly and make sure they're mined and included in the blockchain. PoS, DPoS...doesn't make a difference, in my opinion. If you're building blockchains that are 20x slower (or more) than existing ones, it's not moving things in the right direction. These are blockchains with tokens to be used as currency. It's kind of hard to have a viable currency when any moderate to relatively high volume of transacting isn't possible. Not that anyone actually wants to use crypto tokens as currencies anyway, as most just want to "get rich" by cashing them out for fiat. So maybe 1-minute block times will be sufficient. I just don't see that as innovative at all. But you're not factoring in the use of masternodes and instant payments. When you can have transactions confirmed instantly, block time won't be that important and 1 minute is more than enough imo. Dash was the first blockchain with masternodes and instant payments and their block time is 2.5 minutes. And I agree most people who get into crypto just wanna get rich quick. I also don't think a single blockchain can ever meet the demand of everyone in the world if crypto was ever adopted by masses. It's like expecting one bank to meet the needs of the whole world and every new bank to have something new or innovative otherwise people won't save their money there. I don't think so... I believe any blockchain even if it's a complete copykat, can turn into a store of value if it's not a scam setup by dodgy founders. ...if it's not a scam setup by dodgy founders. Ha! That’s like 99% of cryptos! In today's technological blockchain era you talking about 500 years? SwiftCash will be dead in one year in my opinion. So you prefer a coin that runs out of block rewards faster? And then faces crazy fees or dies? You must be joking. And 1 year is about 12 months. That is another 8 months since the initial launch. Happy to bet against your opinion. I also hope I'm wrong but will see. You mean like bitcoin or steem? Your deposit address is SU6Hh76N7B1tNDkoD2EiSuVV4Kscz1VDpS.